As the Boston Bruins made its 2018 playoff push, two Boston University alumni shined on its roster: defensemen Charlie McAvoy and Matt Grzelcyk. A standout while on the BU squad, McAvoy put up 32 points and was plus-20 while on the ice. Grzelcyk, a Charlestown native who served as captain his senior year as a Terrier, made 12 assists in 63 games. The Bruins play in TD Garden, which can be accessed with the Green Line that runs right through BU’s campus. College Nights offer tickets at a discounted price. Boston also has two women’s teams to its name in the Boston Blades and the Boston Pride. The Blades play in the Canadian Women’s Hockey League and play its home games at the Larsen Skating Rink in Winthrop. The Pride play in the National Women’s Hockey League and play at the Warrior Ice Arena. Both are accessible by train. Outside Olympic years, the teams often host rosters of Olympic champions. Hilary Knight, who won gold for Team USA in Pyeongchang, previously played for both teams. In winning Super Bowl LI, the New England Patriots added another victory to their previous four wins in the national game. Boston had high hopes for its football team, lead by superstar quarterback Tom Brady. The team overcame an 8-point deficit against the Pittsburgh Steelers to claim its ninth consecutive American Football Conference East title, ending the regular season with a 13-3 record. While the Patriots made it to Minneapolis for Super Bowl LII, it was the Philadelphia Eagles who went home with its first Super Bowl win. New England plays its home games at Gillette Stadium, 20 miles outside Boston in the suburb of Foxborough. However, South Station runs a train for Patriot games out to Patriot Place two hours before events. The round trip costs $20 and avoids the typical game-day traffic. When the Boston Red Sox play at home, it’s impossible to miss Fenway Park’s bright lights or crowds of dedicated fans. The historic playing field is across the street from South Campus. BU students can also register with the Sox’s student program for $9 tickets and other special offers. The Sox are currently second in the American League East behind their main rivals, the New York Yankees. For the past two season, Boston has come out as back-to-back conference champions. After a 18-11 record in May, the team has started June with a split 2-2 series against the Houston Astros after former All-Star Mookie Betts was put on the 10-day disabled list with abdominal strain June 1. Postseason is set to to start Oct. 2, right in time to offer some midterm distractions. The Boston Celtics came within nine points of beating out the Cleveland Cavaliers for its spot in the National Basketball Association finals after ending the regular season second in the Eastern Conference. Jayson Tatum, a 20-year-old rookie, led the Celtics in scoring during Game 7 and has some talking about potential superstar status — including LeBron James. Tatum came from a trade down to the third pick in last summer’s draft. Along with the August acquisition of Kyrie Irving, the offseason ended with only four players from the previous season left on the roster. Between the postseason rush and a 16-game win streak, the Celtics seem to be making the right moves. 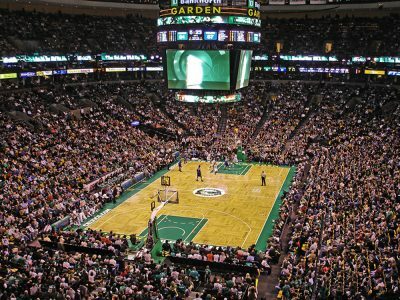 The Celtics share a home arena in TD Garden with the Bruins, an easy inbound ride toward North Station. The team also offers a Buzzer Beater Pass to college students, which offers affordable, last-minute tickets.